I’ve always said more things should have beer in them. Beer is after all one of the 5 food groups, along with rye, barley, gin, and malt liquor. Sometimes sure the product people get it right, with Beer Candy, Vegetable Beer, and Beer flavored Kit Kats, but I often wish they’d just try a bit harder, go the whole hog, really commit, and inject beer into more of the things that we love. When will we have beer medicine? When will we have beer tobacco? When will we have beer books that are written in beer? 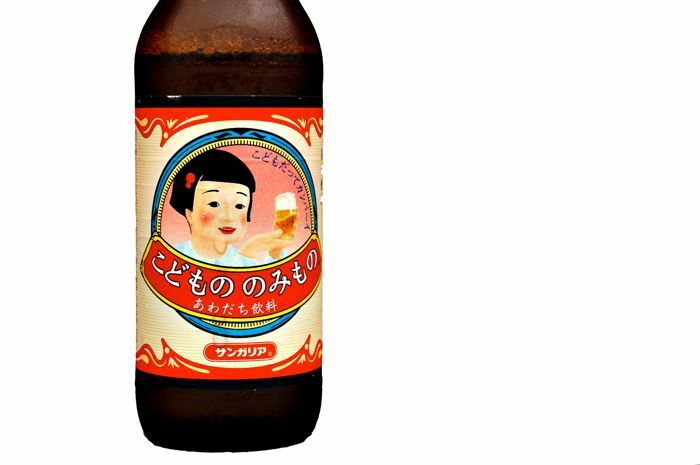 Here from the sunny depths of the Izu peninsula comes one of life’s little beer success stories- Kids Beer! Actually it doesn’t say anywhere on this beer bottle that it is beer. Cowards! What it actually says is- ‘Kids Drink’, which is about as precise as calling your feet ‘somebody’s appendages’ or an elephant a ‘grey thing’. Well, it’s true, so don’t bark up the wrong tree. I’ve been wanting to drink me some kid’s beer for years, ever since I first heard about it on the award-winning blog of well-known numismatist Michael Beddall. He had to go up to fukushima to get his little taste of sweetness, since neither of us seem to have ever seen this concoction in Tokyo. I found it on a recent holiday to Izu. 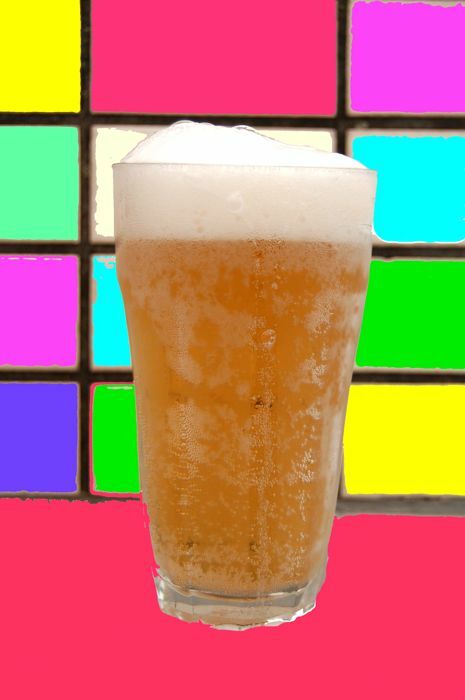 Here is a picture of the beer, poured and gone psychedelic in an attempt to appeal to kids, who I’m told like bright colored things and shiny toys, a little like magpies. Doesn’t it look like a delicious piece of candy? Yum yum! Let’s drink it! And how does it taste? Well, it had some fruitiness, plus a sourish bit of yeasty flavor, but not really like beer, but not a bad approximation for kids. It foams up very nicely. What level of alcohol content does Kids Beer have? Ah, good point you two both, and something I should have mentioned above. It’s not beer at all, but a substitute- hence no actual ‘beer’ on the packaging anywhere. It’s a beer substitute, with some vague beer flavoring, to simulate drinking real beer. How did it taste? Hope you didnt finish it yet. yum yum! Loco- It’s all about proper weaning. One breast milk, the other draft Sapporo. Just as long as there are no stupid Navy hats around, I’m in! This is a great idea. The French give their kids alcohol from an early age and they turn out alright, right…right…….? Akuma, that is why the French are the world-leaders they are today, without a doubt. I love the idea of having kids beer and I wish they would sell it in the UK as it took me years before I liked the taste. They have beer for dogs, so why not for kids? Out of surprised now i only know there is a kids beer. Great sharing on this, Michael. What a crazy concept. I like it! I must have some…. You know we could never sell that in the USA, too many people would be upset. Too bad.